Croatia established an Ecological and Fishery Protection Zone; its application for the members of the European Union has been postponed. There is a plan to establish large LNG terminal in the Northern Adriatic Sea basin. Croatia established 29 exploration blocks in the continental shelf and territorial sea, from Istria to Dubrovnik, where potential exploration of oil and gas is planned. No exploration or extraction of oil and gas is allowed in the internal waters. 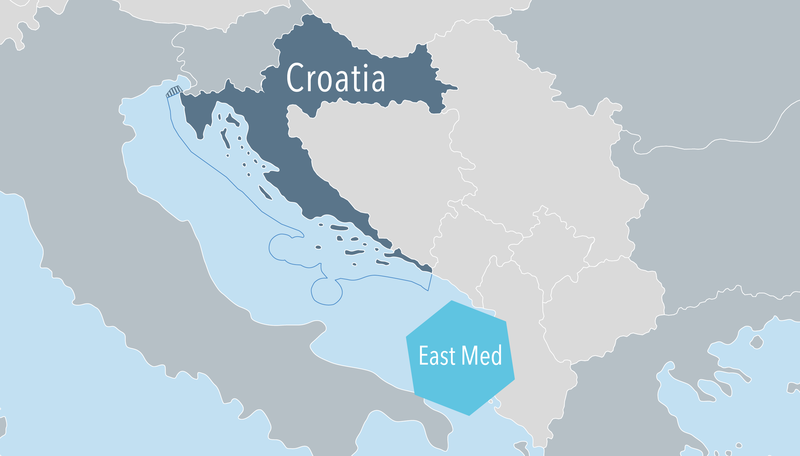 New extraction platforms were initially expected to be operative within 2019, but Croatian government intends to shelve temporarily plans for exploration and extraction of hydrocarbons in the Adriatic Sea. 266 Natura 2000 marine sites are established in Croatia (257 SCI and 9 SPA) for a total sea area of 5,279 km². Currently, there is no a single MSP plan for the entire Croatian marine area, but the entire territory of the Republic of Croatia is covered by various spatial plans, which comprise both terrestrial and marine areas. Following the requirements of the Physical Planning Act, preparation of the State Plan for Spatial Development for the entire terrestrial and marine area (up to the external limit of territorial waters) of Republic of Croatia has been initiated. Two new maritime spatial plans on the State level will be developed: the Spatial Plan of the Ecological and Fishery Protection Zone and the Spatial Plan of the Continental Shelf of the Republic of Croatia. Spatial plans for protected areas managed by national authorities, encompassing both terrestrial and marine areas, have also been developed. Moreover, at the sub-national level, all coastal county plans include provisions for their marine areas (up to the external limit of the territorial sea) referring to different sea uses. The backbone of the legislation on physical planning in Croatia is the Physical Planning Act. The amendment of this Act (Official Gazette 153/13, 65/17) came into force in July 2017, also providing the full transposition of the EU MSP Directive into the legislation of the Republic of Croatia. The Ministry of Construction and Physical Planning and the Croatian Institute for Spatial Development, each within the powers defined by the Physical Planning Act, are the competent authorities for MSP implementation in Croatia on national level.